I am here with a fun masculine card using a vintage-look airmail sticker.....perfect for this birthday card that I will be mailing. :) I had this emboss-resist starry background in my reject pile on my craft table. It hadn't turned out like I wanted for a different project a week or two ago, but I knew it would come in handy sometime soon! My card is fairly self-explanatory, so I will just give you my supply list and make this post super-short! Thank you so much for stopping by. I hope you stay cool in the heat!! Have a wonderful weekend! 7. DRS Designs Challenge #180 - Oh, My Stars!!! What a great vintage sticker image! Love how you used it! Superb! Thanks so much for playing Simon Says Stamp Wednesday “Anything Goes” Challenge! Fun Birthday card, love the mail sticker, beautiful! Great card design and I like the star emboss resist section. Very pretty I love the stars in the circle - Wonderful Birthday card. Don't you love it when you can finally use an element you find in your stash from a previous fail? 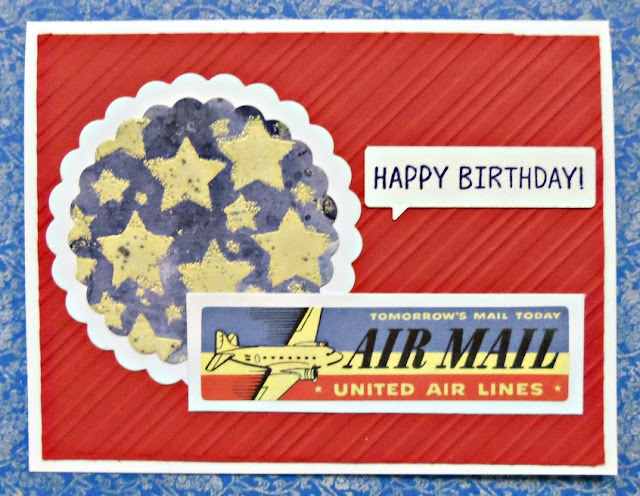 The star panel looks great on this card, and I love the airmail theme! NJ! Oooh, this is such a great card design! I love the embossing folder you used, and that embossed resist star background is wonderful! Love the contrast between the crisp lines and graphic design of the retro Air Mail sticker and the soft ethereal look of those resist stars. Thumbs and wings up on this one!!! Great take on the challenge. I do like the colours and the love embossed background. Great work. Thanks so much for playing along with The Male Room this week! Love this and especially love the "air mail" part. Thanks for sharing with us at Cards in Envy! sweet image! love your captain kitty! Thanks for playing along with our PaperGirls birthday challenge! So beautiful! Thanks for playing along with Frosted Designs!!! !